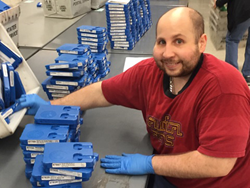 In honor of February being Library Lovers Month, Vocational Rehabilitation shares the story of a young man who wouldn’t give up on his dream to work at the Florida Talking Book Library. When Corey North came to Vocational Rehabilitation (VR), a state agency that helps people with disabilities find jobs, he knew exactly where he wanted to work— the Florida Talking Book Library. “I tried to get him to apply for other jobs because the library didn’t have any job openings, but he always said no,” says his VR counselor, Joyce Barros. “I wasn’t really trying to work at other places, so she [Joyce] was about to get on my case, but then I got the job so she didn’t have to,” Corey says with a grin. Corey is forgetful because he developed dementia at a young age due complications from brain surgery to have a tumor removed. It affected his mood and mobility, and often left him unable to remember instructions. So Corey came to VR in 2008 for help in finding a job, he needed to find a work environment where he would feel comfortable. His mother volunteered as a recording producer at the Florida Talking Book Library in Daytona Beach, so Corey decided to go with her. Corey worked alongside other employees and volunteers at the library inspecting the plastic cases that hold the media when they came in. Each book is recorded either on a cassette or special jump drive and housed in a plastic box. “We inspect them to see if they have the wrong card in them or if they’re dirty, and then get them ready to ship back out,” explains Corey. After years of volunteering, Corey finally learned the library had a full-time job opening. The library was willing to split it into two part-time positions so Corey and another young man with disabilities could both become employed. Corey applied for the job and was quickly hired. If you have trouble reading print as the result of an eye problem, a reading disability, or difficulty holding a book because of a disability, you can apply for library services. The Florida Talking Books Library is under the auspices of the Library of Congress (http://www.loc.gov/nls/) and each state has its own library. For more information how you can become a member of the Florida Talking Book Library, go to http://dbs.myflorida.com/Talking%20Books%20Library/index.html.